"Procurify helps to manage all the operations of your company." This tool is excellent for any company that makes different orders and has an inventory control in constant change, the characteristics of purify are designed, to obtain the best performance in this type of work, allowing to streamline this whole system, and achieve automation most of it, without this tool the inventories and products within our company, would not behave as well as they do now, we can have control of this application of all our products, the employees of the different areas of our company, It is responsible for having control of each of these products, and giving details of the status of each, which allows us to maintain an updated inventory, and always in the best conditions. I do not know what is due, but on occasion, this system seems to hang, and not work as well as on other occasions, it is as if there was some interference with the connection to the server, and you must wait a moment for the system to connect completely and function as it should be, it is not usually a characteristic or an event, that happens every day, but it is something that can happen, and it may just happen when you need to work faster. It is a very good tool for inventory control, where I work, buy and renew inventories at all times, I really would not know what to do without this tool, I would say that most inventory control and orders are made through this system, and it really is a great help, that everything can be controlled from this tool. "Very useful and easy to use"
It is easy to use. And I get notifications by email when there is any change to the orders. I can access it thru the phone app as well as using web browser. When there is multiple items in one order, we sometimes receive them partially. Procurify does not send notification of received items if they are partially received. It only sends one notification once all items in that order are received. But the user is not aware that we received some items weeks ago. That should be added to the notification settings for improvement. I am not sure if there is any other alternative. We only use Procurify and I really recommend it. Easy to use. And they improved the interface quite a bit last 2 years. The approval of purchase orders was taking too much time before. Now managers can approve it online and much faster. Procurify keeps track of multiple requests for spend from multiple channels in one place. I cannot run a report by Item to track spend on any particular item. I can accomplish task by running the report by Vendor, but on same items we purchase from multiple vendors, it is more time consuming. If you need a product to help you keep track of your spending, to provide a review process of spend, and to keep track of purchases post-spend, Procurify fits the bill. It is super easy to use and train others on, extremely intuitive interface, and great support from the Procurify team. Especially in the first 3 months I asked them a lot of stupid questions, and they never made me feel stupid. We have multiple facilities requesting purchases; we can keep track of them all, by facility, without forgetting or leaving out a purchase. I enjoy the approval process and that it keeps all documents and discussions pertaining to the order in one place. It also helps keep track of whether we have received the goods we purchased because we do not close the POs until we have received all items in full and good condition. We also enjoy the search function as this helps us find items quickly when we have very limited information. I like that the POs push to QuickBooks. I do not like that the account code used does not appear on the PO because then I have to click into the order to see what code was used instead of just glancing at the PO. I do not like that the general user does not have access to their PO, only their order. I do not like that POs do not push to QB if they have any characters, such as %. I do not like that a PO cannot be edited once any item on the PO has been received. Great tool for keeping everything about an order in one place and tracking orders to ensure all goods are received in full and good condition. Good for ensuring all purchases are approved within the current budget. Good search feature that helps you quickly find orders, items, vendors, etc. We have reduced the number of orders we place but do not receive product in full or good condition for. Procurify's search feature helps with audits. The search feature helps us find what vendors we have purchased an item from before quickly. "Good system, cheaper alternative to Expensive Expensify with additional features"
Procurify has many strengths in that it allows for procurement, expense, travel and loads of back end features. One of the things I liked best about Procurify is that their product team is very responsive and open to adding changes. I suggested some changes and within a month they actually pushed out a release. I basically wanted more back end tools to be able to extract data out of the system to put into our mapping system which would end up in payroll. The platform is nice and clean and easy to use, and whenever there was any issues they were no more than a phone call away for support. The software is not a completely polished product yet. It works and works well, but certain multi level budgeting needs that I wanted to use it for it was not capable of doing. That being said the price we paid for the software made it difficult to demand all the bells and whistles. It will get there one day though, and very soon! It's great value produced by a solid local team in Vancouver, BC. Their web and mobile platform both works great and is designed very user friendly. As always ask for a demo and see if it fits your company needs. We were using emails as authorization for purchase orders and our team would cross reference the amounts to the planned budget for the quarter/year. What Procurify allowed us to do is empower the department heads, given an allocated spend amount and process procurements and spend through Procurify. Also because Expensify is known to be expensive, we were planning on phasing out Expensify and fully using Procurify as it is very capable of doing so. Lastly, the ability for Procurify to connect and push data to NetSuite was in development, which would help streamline lots of admin work. "Lean software with a responsive team!" Procurify offers solutions for team members involved with every step of the procurement process. My organization has had positive experiences across ordering lab teams, receiving personnel, and Finance personnel. The mobile and desktop UI's interact seamlessly, and we've only had positive interactions with their development and support staff! We would prefer to have a greater depth of prepared training resources from Procurify in both document and video formats. However, their development team is very aware of these needs and has already reached out to promote growth in this area. We use Procurify to support order requests, approvals, receiving, and invoicing. The Finance team in particular has found it be leaner and more responsive than previously implemented solutions, including Expensify. I like the effortless approval flow. No more folders traveling around the office. Also, having the pre-approval process is great. The problems of lost bills, delayed approvals, person buying without authorization, etc. were all resolved with the use of Procurify. Approvals tracked and Pre-Approval of bills were great benefits. "Great UI for a small growing company"
I enjoy that everything is accessible and not complicated to understand. Even as you search, create, and do a little research to report it feels easy and not frustrating at all. I also enjoy the approval process highly! That helps keep our CEO and me in the loop of what the company purchases. That the inventory side doesn't work for our company. If you see you are a small growing company--Procurify will help your process of staying organized and understanding what you are purcahsing on a weekly, monthly basis. What we spend, how we spend, and that each department needs to be taking care of their own order requests instead of just the purchasing associate and/ or manager doing this for them. Also, keeping track of orders and receiving has become so much easier. Benefits: better communication with our Finance Team and seeing how what each department needs are so very different in spending. "Cloud-based technology that gets the job done!" Procurify does a great job of using cloud-based software to simplify the procurement process. It takes time to learn Procurify and get users familiar with it. If your employees are not tech savvy, this program may not be for you. Procurify does a great job of solving the problem of automating the purchase process for users who are remote or traveling away from the office. The amount of time to approve purchase requests has decreased substantially since we started using Procurify. I love how efficient using this program is, it eliminates all paper work and having to send emails back and forth to confirm orders. All the information is readily available just by signing in to my account. Nothing I love the program, it saves me a lot of time. Less paper work. Omits back and fort emails, the stages of a request can be seen just by opening Procurify. Which eliminates time wastage. Streamlining of procurement process . Setup and lack of some key features . Consider your current integrations and how each software will talk to the other. Procurify has helped our company streamline the approval process throughout departmental purchases. Their pricing is very fair and does not increase as you add more users who have only access to submit purchases for approval, providing a lot of flexibility when the company scales. Being a new product, there is lots they can do to improve, including adding additional integrations with other services and ERP, however, they are well aware and are continuously iterating and adding features. Procurify is an user-friendly tool that allows organizations to to track purchases for employees. This tool allows the ability to order tracking and delivery updates so you are well aware when to expect your product. An added bonus is that Procurify has a mobile app and is integrated with Slack. Something that Procurify can do better is reporting. It'd be nice to have more customer friendly reports based on usage, custom attributes, segmenting by departments, etc. We are trying to track and monitor the company spend. Benefits include the software design, ease of use and customer support. "Great way to track company purchases "
"The best procurement management system out there!" Their system is cloud-based, making it easy to use on any platform. The user interface is easy to use as well meaning anyone from a beginner to an expert can figure out the system in a matter of minutes. Software that you can literally turn on, and deploy in a matter of hours for small organizations to a few days for larger more complex deployments. The system is self-contained and easy to use. Their support is top notch, each quarter I get a call from someone in upper management just to make sure things are going well. My customer success rep Jessica is amazing. They answer emails even when they are sick to make sure your business can continue. Procurify is a software made by a company who cares about your company! Nothing, everything that becomes a problem is easily taken care of by their support team. If you have a request for a feature they are open minded and will try to make it work to help your organization out. There is nothing to dislike about this software. Look at your current systems and figure out how you want routing for approvals to go before trying to set up. If you figure out your routing, locations and users before you go into the system it is a breeze to set up. I have used SAP, Oracle, and many others and Procurify by far surpasses them in flexibility and quality. The price is also something to consider, other systems are by far more expensive and offer way less. When I came to my company, it was run by spreadsheets. Being able to go to Procurify has helped streamline our purchasing process. Taking the average purchase cycle down by almost two weeks! We can track, or easily find orders and identify issues. For audit reasons this software is amazing as you have a digital signature on every step of the way, there is no question who did what or when it was done. The way Procurify pulls the appropriate information from a website makes adding new items extremely easy. The inability to remove an approved order that needed to be cancelled from the "Approved" section is annoying. Initial training on the systems and procedures with Procurify were very helpful in the implementation phase. Tracking purchases across dozens of staff was extremely painful before Procurify was implemented. "straightforward solution with fast & friendly support"
When creating reports the only visual available is a bar graph. I prefer visualizing data in pie chart form and hope others feel as I do. The more customers that request a feature, the more likely it will become an option. If you have a good idea what you need then discuss it with the nice folks at Procurify. They will show you how they can meet, and exceed, your needs. Everyone I've had contact with at this company is kind, helpful and supportive. They want you to succeed. "Great system that helps keep our procurement organized"
In past companies there was always lots of emails back and forth when it came to purchasing and it would get hard to keep track of what exactly someone needed purchased. Procurify provides an easy to use interface for people to enter exactly what they want, how much of it and estimate the cost. This makes it significantly easier from a purchasing and budgeting standpoint to approve requests and process them. It would be great if it could integrate more with the actual vendors that we use for purchasing, there is still a lot of manual work to complete purchases, but this system does make it a lot easier. This streamlines our ordering and expense processes and allows us to keep an eye on our budget. It is simple enough to use and saves a lot of time. We can look at the history of orders, current status and reorder items without hassle. you can notify the people in the procurement chain to let them know that there are items need to be approved. Keep track of orders PO's and delivery statuses. "Great piece of software to get expenses approved"
I like the fact that it is very easy and quick to submit any expense or product purchase and get it approved in the same day. Sometimes the notifications are delayed & end up in my Spam when something is approved and the chats are very cluttered. There are sometimes too many options when I am just submitting a simple expense that makes it a confusing process. Approving expenses quick and easy. 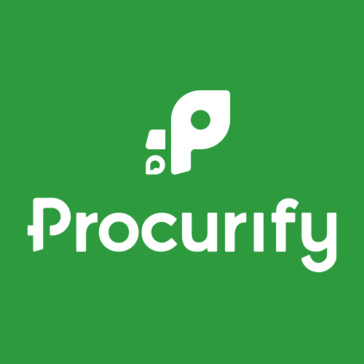 "Great tool for tracking vendors and creating and approving purchase orders"
Procurify is very easy and intuitive to use. I am able to keep track of vendors and orders and create and approve purchase orders. The inventory import feature is very useful if you already have a spreadsheet of all your inventory and would rather not type it twice. Mobile app feature is also nice to have. Free trial is available which is nice for trying out the software. It would be nice to have an inventory feature to keep track when low on supplies and request order in the same software. Easy to use for order tracking and PO creation. Multiple approval steps. Ability to receive ordered items on different days and attached packing slips. I am able to create purchase orders easily and keep track of everything ordered and received. Without procurify everything is done manually in Exel. "Simply effective and fabulous procurement platforming"
The intetface is intuitive, making it easy to use, not to mention the chat option whenever you get stuck or can't find something, which rarely happens. The platform speeds up the procurement approval process and makes supplier management and payments super efficient. "I can say its fair"
"Robust Purchasing System with Excellent Support"
The team at Procurify has built a great product that they are improving constantly. From Planning to Paying, it is a one stop solution. That is a tie with the total commitment to customer satisfaction. Nothing. The mobile app is in some ways even better than the desktop interface. We did not have a purchasing system. Also Budget tracking at purchase time. "Procurify is the way of the future"
I love the fact that you can track and comment on a particular order. I have been using this application for over a year now and honestly, I don't have anything negative to say about it. If you are looking to improve communication and perfect Purchasing in your institution then this is the way to go. My institution purchased Procurify because of a break down in communication, especially where purchase orders were concerned. This has now led to fast responses and better follow-ups. "works great at my job"
whats good is that it notifies you when the items you order are in and ready to pick up. helps speed up the buying and placing order process. "Procurify works well for our business"
Some things seem restricted, but that may be something control by our local administrator. A good accounting flow for tracking purchases for each project. It is very simple and easy to use system so far. The csv upload is very helpful. I do not like when I have to fill each order, but the csv already fixed this problem. It helps to track order status easily. "Somewhat easy to use! " I like that you have a dashboard that assists you in keeping track of past and pending requests! I dislike that the system is not very intuitive or easy to use. I've never had any issues with Procurify - it's very intuitive. Nothing that I can think of - there really isn't anythiing missing from the platform. It's very user friendly, but not at the expense of being over simplistic. Web based interface is intuitive and the phone app is very convenient to use. I would like to see orders automatically approved if not actively approved or denied within a certain timeframe (ie, 2 weeks). Maybe this functionality exists already, but is not used by my company. Easy tracking of order approvals. I like that the product is cloud based and that I can access it anywhere. Sometimes the server is slow and it takes a while to load but this is improving. Procuring helps us stay organized with our numerous ongoing projects. That what you enter is not private to the individual entering it....although, it may be how to account is set up for the company I work for. Organization and ease of accounting practices. The ease of using PROCURIFY. Everything you need to know about your orders is on one page. Cannot think of anything that I do not like about PROCURIFY. Time. Less time entering processing orders. "Mt Baker Vapor loves Procurify"
* We monitor all Procurify reviews to prevent fraudulent reviews and keep review quality high. We do not post reviews by company employees or direct competitors. Validated reviews require the user to submit a screenshot of the product containing their user ID, in order to verify a user is an actual user of the product. Hi there! Are you looking to implement a solution like Procurify?